At Class Fundraising we are strongly aware that what we do impacts on the environment. We do everything we can to make sure we have minimal impact on the planet. Here are some of the things we do to ensure this. 1. 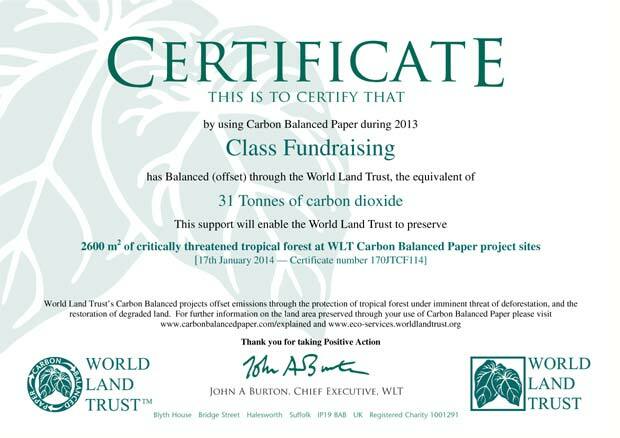 Paper – We only use FSC and World Land Trust Accredited paper. This means that we can off-set the amount of Carbon we use and save Critically Endangered Forest. 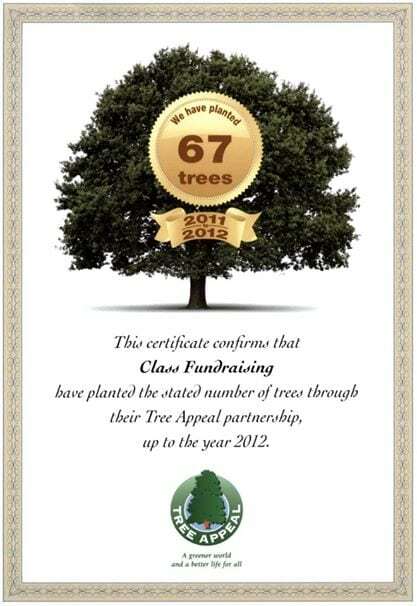 In just 2 years your efforts at school have saved over 5000 square metres of Tropical Rain Forest. 2. Sourcing of Products – We use UK manufactured products where possible. Obviously we know that cotton doesn’t grow in the UK (If only it did we would have better summers). Most of the manufacturing processes that occur are on UK soil, this way we can be assured that a fair wage is being paid. Where we do have to look further afield we try to ensure we are using the most ethical suppliers we can. 3. Inks & Chemicals -All of are inks and chemicals are safe, we do not use solvents – not even when cleaning. Our inks suppliers all have accreditation to the soil association. Most of our inks are vegetable based. We do not use any nasties, so you can be assured they are safe. 4. Recycling – We try to use the minimum amount of paper possible, however as most of our projects are template based we have to do quite a lot of printing. At peak times in the year we have extra recycling bins that take all of our cardboard and paper away to be reprocessed. All of the Christmas card templates are securely shredded and recycled each year. 5. Energy – We keep our usage to a minimum by having timed lights, we reuse heat from our driers around the factory so we are kept nice and warm in the winter months. Since employing better practices we have seen a drop in our energy usage. Certificates, some of our certificates from over the years.